A few years back I attended a lecture given by Shigeru Ban who spoke about a few of his projects at Victoria University in Wellington. I was surprised at his humility and his light-hearted sense of humour. To say the least it was a memorable, inspirational and enjoyable lecture. Ban's work is sincere and simply beautiful, and serves a varied clientele. As Ban responds in an interview with Metropolis, he was "tired of working for [privileged people with money and power]" and believes "architects can use [their] experience and knowledge more for society". 1 - Christchurch Cardboard Transitional Cathedral in Christchurch, New Zealand following the 2011 earthquake. Ban designed this pro bono (for free), the design of which features 86 cardboard tubes and a polycarbon roof supported by eight shipping containers. 2 - Hannover Expo Japan Pavilion, a grid shell structure, whose recycled paper tubes could be dismantled and again recycled. 3 - Paper Emergency Shelter for UNHCR during the humanitarian crisis of war-torn Rwanda in 1994. Before Ban designed his paper solution, refugees were provided with aluminium poles. Bus as aluminium fetched good prices on local markets they preferred to sell them. 4 - Paper Temporary Studio on top of the Pompidou. After winning the competition to design the Pompidou Metz, Ban set up office (with a paper structure - of course) on top of the Pompidou do that he could oversee every detail relating to his design. As Ban jokes in his Ted Talk: "Free rent for six years!" 5 - Privacy Screens for large open-spaced public facilities following the Japan earthquake. 6-9 A Paper Tube School for China's Sichuan province following the quake in May 2009. Continuing the theme of modular furniture (see Prisma post here), designers are continuing to use the idea of "employing or involving a module or modules as the basis of design or construction" (Google definition). MAXintheBOX modular table-chair combination by Perludi. Able to be used as a classic table-chair combination, as stools for adults, as a grocery store or a shelf for books. These designers are working on the premise for designing for many possible applications or configurations - which are as endless as children's imaginations. Friedrich Froebel the pioneer of Kindergarten saw the opportunity apparent in modular objects which would reflect his belief in the relationship between physical activity and learning in young children. Left are Froebel's 'third, fourth, fifth and sixth gifts' assembled into forms of each of the three realms. Right is Froebel's 'seventh gift' consisting of triangular and quadrangular tablets of coloured paper. A system of play objects called the 'gifts and occupations', such as balls, blocks, sticks, paper and clay were introduced to the children by Froebel in a sequence of creative exercises intended to inspire learning and to instill in children an understanding of the "sacred language of geometry" which he believed as the basis for life. These abstract-design activities were intended to cultivate in children the ability to observe, reason, express and create. Below are a number of current furniture and products that today are using the modular methodology - allowing flexibility, for one to arrange as desired and inviting the user to interact in it's arrangement and/or construction. The Citybook Storage System (above) designed by Mr Less and Mrs More is a modular shelving shelving system comprised of a 'house-like' angled module, lending itself to distinctly different compositional possibilities - different to your usual shelving unit. Fabricated in sheet iron, they're joined by magnets, making them easy to assemble and disassemble. Storage need not be purely functional, but may be fun, sculptural and decorative - brightening up a space and bringing a sense of play. Giant LEGO Bricks (shown left) may be stacked (like the originals) AND as storage for children to stash their goods in. 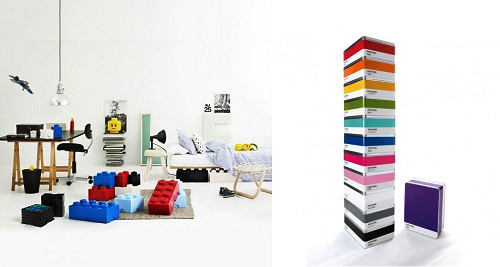 Likewise with these stacked Pantone Storage Boxes, which are designed by Selab for Seletti. Side table, bedside table, stool or desk, the YooBoo PEW designed by Native Creative may be easily slotted together and comes in a variety of colours and patterns. 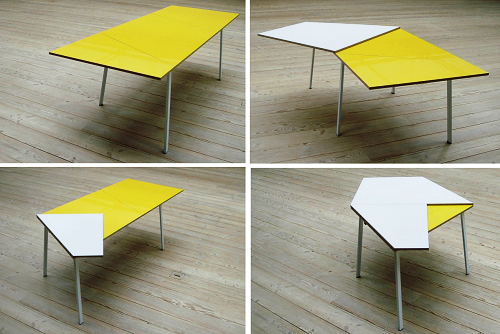 While not strictly speaking "modular", this folding table may be altered (or folded) into a number of configurations to suit the user's mood. The Unfold Table designed by Morgan and Marley breaks the standard notion of a table - and shows that it can be so much more - and inspire fun! Carrying on from Froebel's blocks, a number of new beutifully crafted wooden blocks are again emerging for children's play. Like shown here (Tegu - Endeavour set) these toys are simple and will last for generations - thus a worthy investment. Made from 100% natural wool, these ZIP rugs designed by Alberto Sánchez are made of interlocking pieces that create amusing coloured hexagons, superimposed with triangular mathematical shapes - allowing maximum amounts of customisation. These colourful Puzzle Cushions (or poufs) from Buzzi are flexible, versatile and fun-ky. Whether for children or adults, these modular examples show how any product may be designed to not only be functional, but inspire the imagination and inject a bit of fun (and learning) into our spaces. Playscapes have posted these "sensation paths" or "barefoot parks" that are coming out of Europe, where one's "unshod foot" may experience a variety of elements and textures. A fantastic idea which may be applied to early childhood environments. Below from Barfuss Park are a number of ideas for building your own sensation path, including balancing beams, stone plates, knotted ropes hung from trees, mulch/bark, tree stumps, board walks, loose materials (like stones or sand), wading through water, scented gardens, mud pools and spaces for reflection or rest (e.g. a hammock or bench seat). Literally, these can be incorporated into the early childhood setting. Less literally, the notion of designing for the senses is not a new idea. Margaret McMillan heralded fresh air, sunlight and scented gardens to improve the health of the child. Maria Montessori and John Dewey advocated the "do it yourself" attitude with tasks and activities for the child's learning. Whereas Rudolf Steiner used architectural form, textures, shadow and light to create space that inspired the child's imagination. It is prudent however to remember and reflect on how architecture responds to the child's many and varied senses. From left: The Flying Carpet project by Area Architecture, Black Locust Wooden bench in Canal Park, Washington, and Kindergarten Guntramsdorf, by GOYA. Balance, acceleration and kinesthetic (awareness and perception of one's body) sense is important for a child's development. Thus architecture must allow children to "test" their physical capabilities and motor movements (run, skip, jump, slide etc) so that they may become confident individuals. From left: Casal de la Joventut de Novelda by Crystalzoo, Nursery School by Rocamora Arquitectura and Sant Martí Primary and Infant School by SUMO Arquitectes + Yolanda Olmo. Playful, textured and varied surfaces - inviting one to 'touch' may stretch across the floors and walls. Thus blurring the boundaries and infusing a sense of wonder or excitement into the architecture. From left: New Shoots Children's Centre by Collingridge and Smith, Heidelberg kindergarten by Behnisch Architekten and The Children’s School by Maryanne Thompson Architects. Wood, grass, stones, rocks, sand, shrubs, water - all are natural elements offering a variety of sensorial experiences. From moving, rearranging, collecting and being able to feel texture and a sense of warmth or coldness. From left: Mirror House by MLRP and Nursery School in Berriozar by Javier Larraz + Iñigo Beguiristain + Iñaki Bergera. Reflective or colourfully painted features add to the child's visual experience, arousing movement and giving space a unique identity. From left: Kidtopia in Amsterdam by DUS Architects, Winnetka Public School Nursery by ArchitectureIsFun and Kita Dragon by Baukind. Steps, slides, climbing elements and space for creative expression continues the kinesthetic sense of hand-eye co-ordination and sense of self awareness. From left: Ying Yang Public Library by Evgeny Markachev + Julia Kozlova, Melbourne Central Retreat by Clare Cousins Architecture, Architects School in Ljubljana by Svet Vmes and Skanderborggade Day Care Centre by Dorte Mandrup. Important also to play, is to design for down-time - rest and contemplation. This can be through the use of seating, creating niches or "hidey-holes", through using calm colours and soft warm textures. Leading Australian architects and builders are again tackling the Under Cover Cubby House Challenge, an annual competition demonstrating sustainable building design to create fun and unique play "cubbies", while raising money for Kids Under Cover who support homeless and at-risk children. 2011 Entry - 'The Milk Bar' by Good Constructions & Atkinson Pontifex, with Maddison Architects uses funky colourful recycled milk crates. This year's event, including an auction and raffle is held at the Cubby House Village at the Melbourne International Flower Show from Wednesday 26 March to Sunday 30 March 2014 in Australia. 'King of the Castle' (left) by Carr Architecture & De Carolis is a reference to the dreams of young kids to be King's of their own castle on the playground! Featuring a fireman's pole and porthole windows, the form with its fluted top reflects the castle's tower embattlements. Right, 'Cloud Climb' by Studio You Me & Tandem with Fridcorp & Luxe Property is a slick and 'modern' miniature home featuring a kitchen with island bench, blackboard walls, internal stair case to the first floor loft, operable roof and a suspended hammock floor. 'Caravan Me Happy' by Little Green Room is inspired by childhood summer holidays. Using only sustainable products the curving caravan form appeals to the 'inner child' of all ages. 'The Hatch' (right) by Porter Davis Homes resembles a forest hut. Externally, angled walls, weathertex cladding, plywood and a rust-iron finish to the entrance is combined with a play bench, comfy corner seating and a colourful ball pit internally make for a snuggly hideaway. Left is 'The Grubby' by Cedar Woods Properties and dKO Architecture with Madison Projects, which is based on children's building blocks. The design encourages children to immerse themselves in a world that they will build themselves; with an assortment of features including an interactive pegboard wall, climbing net, dress-ups and chalkboards. 'Switch' by Sabi Designs with Harris HMC (right) is designed to allow children to "switch on" their imaginations. The cubbie's 'tools' to accommodate this include a garden, wall art and LEGO. The construction utilises sustainable materials and techniques, solar energy and pump based rainwater. "We saw the cubby a little like an empty cardboard box that can be turned into anything," says architect Brett Nixon. 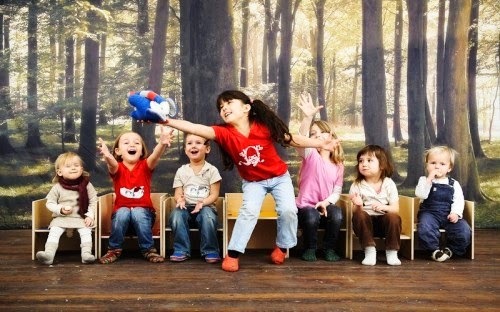 "Children have unclouded imaginations that create play and scenarios out of the most simple things." From the 212 challenge, 'Cubby Life' designed by Six Degrees Architects and built by Ducon "is a sanctuary that kids can retreat to a place of their own, where the screen-mediated world is unplugged and where they can embrace their dreams and their friendships. Its innovative, sustainable design encourages kids to commune with nature, to interact with the space and to let their imaginations run free” says the team. The design featuring botanical walls, a planter fed by rainwater run-off, recycled timbers, plywood, pigeon holes and under-seat storage and a day-bed offering a soft surface on which to play, converse or nap. Also from 2012 is 'The Bird's Nest', designed by Australian politician Ted Baillieu (previously an architect) and Australand. A cosy wee hideaway for "nesting" in. Above are a selection of the 2013 entries - including ‘Mini Giant’ by Maddison Architects with Stonehaven Homes; ‘Your Name Here’ by Gunn Dyring Architects with David McDonald Builders; ‘The Zimmer’ by Porter Davis; and ‘Enchanted Cubby House’ by Positive Footprints. It is great to see architects and builders getting together to create fun and playful spaces not only for the children but for the "inner child" in all. Not only is it a great cause, but advocates a way of designing for children that inspires the imagination. Prisma, designed by Alexander Lotersztain for Derlot in Australia is a collection of angular lounges and ottomans that can be configured together in an endless array of configurations. A concept which could be applied to an early childhood setting in configuring flexible spaces for the centre's diverse pedagogical needs. A triangular wooden side table, a colourful rhomboid ottoman and couch create interesting geometric object arrangements while dividing space. Pathways ECI (Early Childhood Intervention), a not-for-profit centre in Marickville, Sydney serving disabled children (either with mental disabilities and/or social disadvantages) has been given an exciting upgrade. RAW Architects kindly offered their services in doing some of the work pro bono to assist the centre in establishing a path to funding; where the centre following receiving Development Application (DA) approval in June 2012, received a 1.5m grant from Government and corporate funding. A deserved feat for the growing cause (and the hardworking and generous volunteers). The entry is characterised by a house "cut-out" or profile that cuts into the building's outer skin. Marking for the child a strong arrival moment or transition from the outside to now being within the safe confines of the centre. As seen left, the jagged cut into the buildings grey profiled steel metal cladding reveals a striped colourful strip, thus breaking down the scale of the building, whilst giving a sense of drama and play. Also seen left, is an undercroft (transitory zone) that connects the play areas to the rear of the centre. Right is the entry reception and waiting area for parents. Much of the original structure was retained and adapted, including two playrooms (as seen left) and associated service spaces. While new joinery and floor finishes integrate the existing spaces with the new. Shown right is the new sensory room, which breaks out onto Jarvie Park. The flexible room provides space for various "play" activities. The indoor space providing soft modular mats, cushions and canopies; the outside a blue turf, green mounds and gardens. Colour is carefully selected - used for transition space (the vertically clad soffits in an array of oranges, yellows and red) marking the event from passing from one space to another; and red doors signalling play rooms, while yellow doors signal a bathroom. Inside colour is neutral as to not detract from the hustle of activity occurring within. The site's many outdoor landscaped spaces establishes a direct interface with the building - providing the building's inhabitants with "niches" for relaxing, socialising and enjoying the fresh air. Clerestory windows draw in morning light and the LED stip lighting and warm materials provide a sense of homeliness to the spaces. Integrated joinery (like the cubbies and cupboards seen above) shows the architect's consideration to detail. The handles - one big and one small, representing the relationship between carer and child. Pathways offers a combination of day services that are located at the centre and home visit services that cover over 20 surrounding suburbs. The planning layout of the centre provides hot-desking space for staff who spend a lot of time on the road. Through the use of screens and intermediate break-out spaces a balance has been struck between the collective culture of the centre and the need for separation of individual staff. The project is one that considers the views of the child and the wider community - staff, parents and caregivers. A robust, friendly and manageable facility - the design also through it's use of colour, texture and detailing appeals to the child's inquisitiveness and sensory experiences. Rowena's colourful art brings vibrancy to public spaces - why not commision or engage young children to do the same? Rowena Martinich interrupts "dead" or "seen but never noticed" spaces with her vibrant brush strokes - giving to the passer-by an experience that makes one stop, contemplate and be inspired. From Claire Anna Watson: "Today, the role of the public artist is to inject our cities, our urban and public spaces, with imaginative and creative possibilities. Public authorities realise that creativity has its place in enlivening spaces and encouraging community members to imagine – to be inspired, to feel reawakened." It is a concept that reminds me of the Reggio preschools in Italy, whose first Diana Preschool featured large grid-like floor to ceiling windows - where children's semi-transparent or cut-out artworks were proudly displayed (see bottom-right). It makes me wonder if children's creative capacities are in fact being utilised in the public realm, and the possibility for children to collaborate with artists in creating transient, "pop-up" artisitic installations. What a fantastic project not only for children, but for the wider public! Chromacut - collaborative between Rachel O'Connor and Rowena Martinich nad young artists with artwork displayed on the glass facade of the SIGNAL youth arts space in Northbank, Melbourne. Artists have used luminous paints and vinyl cut outs to create a giant sticker installation in conjunction with night-time projection. Chromaphos at Euroluce - Shattered forms and luminous brushtrokes splay across the façade of Euroluce’s Melbourne showroom. Dagmar Rousset - Colourful knitwear storefront. Common Gesture - a 136 square metre painting installation adorned the facade of Building 15 at RMIT University - one of Melbourne's largest ever public paintings. Viachroma - Dandenong Station - a 17m long, double sided painting installation on the pedestrian overpass of Dandenong Station where more that 8,000 commuters passing through every day. Previously blogged Te Mirumiru in Kawakawa, Northland has been deservedly awarded a 6-star Green Rating by The New Zealand Green Building Council (NZGBC) - the first educational building to receive the award, representing world leadership in sustainable construction. With a gently curved concrete structure, the building is covered by earth and grass on its roof and unglazed sides, integrating it with the landscape and paying homage to the tribe’s customs and history (‘Ngati Hine of a hundred hills’). Well done to Phil Smith and let us hope that more inspiring and "green" sustainable educational buildings follow in it's stead. Via Collingridge and Smith Architects. Showcased as part of the 'Garden for Children' exhibit at the Museum of Contemporary Art Tokyo in July 2010 is the 'Cheering Mountain' - a playspace with a gigantic blackboard. Designed by Mikido Endo (of Office Mikido), the architect wanted to present art not as something to think about but instead as something participants would feel through their bodies. The unusual scale and mountain-like shape of the blackboards; the cushions at the base; the peek-a-boo holes and strange arms - encourage children to climb, jump, and spread their creative energy into every corner. After the two-month exhibition period, the gigantic mountain was no longer a blackboard but a funny creature with white hair. Anyone entering the space was immediately greeted by the amazing creativity of the the former visitors. The re-interpretation of these iconic artists (see Mondrian below) remind me of Brosterman's comparison to modernist art and the Froebel "gifts" (see previous post). Italian artist and architect Federico Babina explores the symbiotic relationship between architecture and art, and how they would interact with each other. Says Bambina: "I like finding the hidden architecture in parallel universes, in this sense, the illustration helps me to explore alternative languages". It is a methodology that might be well received in designing for children - what does a child's art tell us about how their architectural environments should or could be designed? Via Dezeen (read full article here).